ESA Science & Technology: Why LISA Pathfinder? Gravity remains the great cosmic mystery. Although it was the first force to be described mathematically, by Isaac Newton in 1687, we still do not know how it works. Our best modern description is Albert Einstein's General Theory of Relativity. LISA Pathfinder was launched on 3 December 2015, one day after the 100th anniversary of Einstein's publication in which he presented the final form of his equations that describe a gravitational field. These ten 'field equations' are the heart of general relativity. 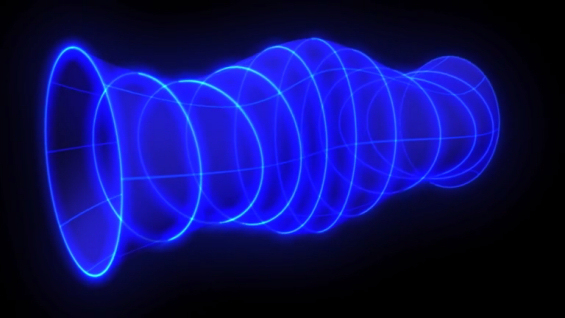 They describe a four-dimensional mathematical landscape known as the spacetime continuum. General relativity is successfully used in maintaining the accuracy of satellite navigation signals, describing the motion of the inner planet, Mercury, and providing clues about some of the strangest of all celestial objects, black holes. But there is one huge prediction of general relativity that remains just beyond our ability to directly detect: gravitational waves. These are minuscule ripples in the spacetime continuum that are produced by some accelerating objects. They are analogous to the ripples on a pond made by the drop of a pebble. As they pass, they change the distance between points in space. Once we have the technology to detect gravitational waves, we will see the Universe as never before. It will be like the difference between going from silent movies to our modern cinema experience with surround sound. We will have the ability to peer into the hearts of colliding stars. We will see black holes forming at the edge of the known Universe. And we will truly be able to test whether general relativity works in the realm of extreme gravitational fields. In order to feel these gravitational ripples and do these amazing things, one must first be sure that all other forces can be isolated and removed. Otherwise they will swamp the signal. No one can detect the pebble’s ripple on a stormy ocean. LISA Pathfinder's mission is to prove that it can shield two metal cubes, which form the core of the payload, from all internal and external forces better than any other spacecraft ever flown. This means flying in space to within an accuracy of a few billionths of a metre (nanometre), and being able to sense the relative positions of the metal cubes to within a trillionth of a metre (picometre) over the bandwidth of interest. The metal cubes will be free-floating inside the spacecraft. This is why the technology cannot be tested on Earth – our planet's gravity would pull them toward the ground, ending the experiment after a few seconds at most. In space, however, the masses will float freely for a long time, shielded from other influences by the spacecraft. They will move only as gravity dictates. The spacecraft will manoeuvre around them, sensing their motion and adjusting its own to compensate. LISA Pathfinder will be the most perfect fundamental physics laboratory ever flown in space – and it is only the start. ESA has designated its L3 mission – the third large mission in the Cosmic Vision programme – to be an investigation of the gravitational Universe. Set for launch in 2034, a call for missions will follow the inflight demonstration of the LISA Technology Package performance. One mission being considered by the science community is the evolved Laser Interferometer Space Antenna (eLISA). This would use the technology developed for LISA Pathfinder to build a multiple spacecraft mission that could directly observe gravitational waves and start the era of space-borne gravitational wave astronomy.